Patio Fireplaces . . . Multiple Choices! 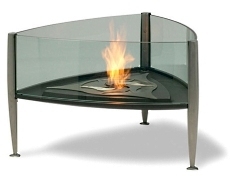 Patio fireplaces come in many forms, shapes, sizes and styles. They can be built-in or fixed in place, such as the striking stucco hearth pictured below . . . . . .
or modular prefabs, which are capable of being moved or repositioned, if necessary, albeit with a fair amount of effort due to their weight (may also require partial dis-assembly to be moved) . . . . . They can be faced with brick . . . . . or stone . . or one of a wide array of other materials. They can be fueled by gas (natural or propane) . . . . . . . or wood. Alternatively, you can opt for the convenience of a prefabricated unit that is already "packaged" for you, such as those pictured below, many of which also have barbecue and grilling features. day. As a result, you are bound to find one that is just right for you! 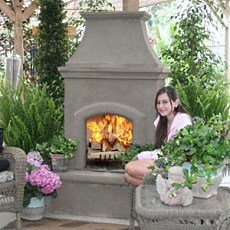 quently add new designs for outdoor fireplaces to our site. Fond Memories of Summer Camp! Custom Looks without the Costs!